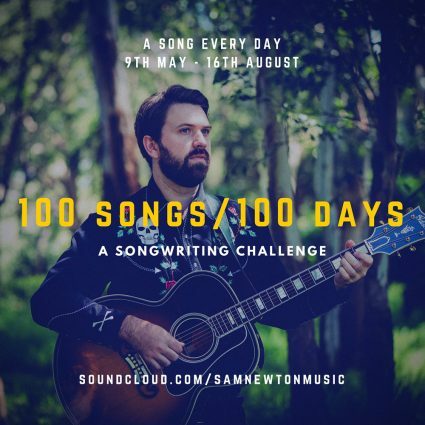 In my time spent exploring the internet, researching songwriters and reading independent musician blogs, I have occasionally come across something known as the 100 songs in 100 days Challenge. With this floating somewhere in the back of my mind, I sat down on Monday with my guitar, coffee and iPad. I had just finished the successful run of A Man Walks Into A Bar, performed at least 15 shows in 3 weeks, and was yearning to write some fresh material. I wrote a song that I was happy with in about 30minutes. Then it hit me – why can’t I do this every day? Sure, there’ll be plenty of mega flops… But I’m bound to stumble onto some gold every now and then. The 100 Songs in 100 Days Challenge has commenced. Check back to my Soundcloud page every now and then to see how I’m going. If I make something that you love, please let me know! This could be a whole new album that I’m writing in the next 3 months. I’m also going to be putting a survey up every 10 days to find the best of song for that run. Be sure to vote and have your say.